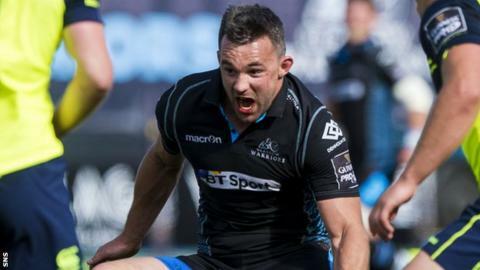 Italy flanker Simone Favaro and Canada prop Djustice Sears-Duru will exit Glasgow Warriors this summer, the Pro12 club have confirmed. Favaro has made 29 appearances since he joined from Benetton Treviso in 2015, but the 28-year-old has not been offered a new contract. However, coach Gregor Townsend said: "He is still a key player for us as we enter a period of important games." The 22-year-old Sears-Duru has played only four times. He was part of Canada's 2015 World Cup squad and joined Warriors last summer after leaving Ontario Blues but has been loaned out this season to Scottish Premiership club Ayr. Favaro, capped 34 times for Italy, was voted Glasgow's 2015-16 player of the season but has played 10 times during the current campaign. However, the club have already signed Callum Gibbins from Super Rugby champions Hurricanes as a replacement for next season. "Simone has been a very popular figure at the club over the last couple of years and always puts in total commitment every time he plays," added Townsend.